Galway will be a busy place towards the end of this week. 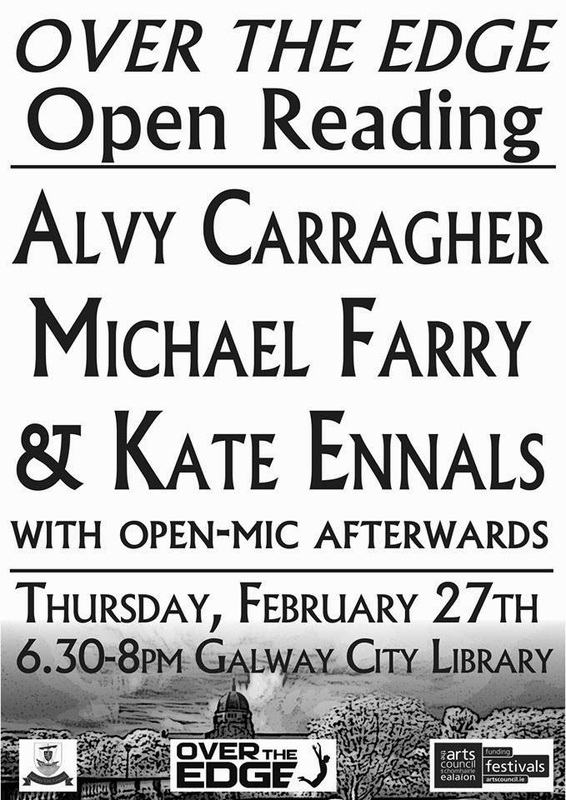 Thursday sees the February Over The Edge: Open Reading with Alvy Carragher, Kate Ennals and myself. The evening also included the announcement of details of 2014 Over The Edge New Writer of The Year competition.That's on Thursday at 6:30pm in the Galway City Library. Then Friday sees the Launch of issue 35 of Crannóg magazine and the 2014 Wordsonthewaves Anthology (WOW! ), 6.30 pm to 8.30pm in The Crane Bar (upstairs), Sea Rd., Galway. This will include readings of fiction and poetry and the presentation of WOW! Awards by Mr James Harrold, Galway City Arts Officer. I'm delighted to have a poem included in this issue of Crannóg and hope to attend. Crannóg will be on sale @ €6. WOW! Anthology will be on sale @ €10. I notice that Charlie Byrne's Bookshop is hosting its annual Japanese – Irish poetry evening, also on Friday 28 February at 8pm. This year world renowned Tanka poet Hisa Kagawa will be joined by Nicki Griffin, winner of the 2010 Over the Edge New Writing Prize, who published her debut collection with Salmon Poetry in 2013. A significant number of the 250 poets in this anthology, The Poet's Quest For God: 21st Century Poems of Faith, Doubt and Wonder, edited by Dr Oliver Brennan, Todd Swift and Dominic Bury, are Irish and I'm delighted to be among them. 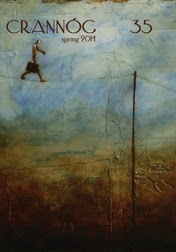 It is being published by Todd Swift's Eyewear Publishing. The Poet's Quest For God, with an Introduction by Dr Ewan Fernie, features over 250 of the leading poets now writing in the English language, mostly represented by new poems of the 21st century. This is a book that will delight, inspire, amuse and challenge, in equal measure - as each poet explores the questions of faith and doubt from their own particular perspective. This is the first contemporary global anthology of poems of spirituality and religion to feature poems by Atheists, Agnostics, Christians, as well as those from the Jewish, Muslim, Hindu and Budhhist traditions. The poets are from America, Canada, Ireland, the UK, India, and elsewhere, including Patience Agbabi, Kazim Ali, Fanny Howe, Mimi Khalvati, Stephen Burt, Christian Wiman, Charles Bernstein, Rae Armantrout, Andrew Motion, Elspeth Smith, Annie Finch, Alfred Corn, Ilya Kaminsky, and hundreds more. This beautifully designed anthology - in hardcover - will be over 300 pages and a perfect gift for all occasions, a bedside companion, and a potential classic for decades to come. This is truly a benchmark publication, waiting to happen. In order to cover the costs of design and publication in a large print run, Eyewear would like to call upon your support to make this book happen soon. There will be launches in several major cities. To pledge or preorder please go here. I'm really looking forward to this, a great venue, great audience and great fellow readers. The February ‘Over The Edge: Open Reading’ takes place in Galway City Library on Thursday, 27 February, 6.30-8.00pm. The Featured Readers are Michael Farry, Kate Ennals & Alvy Carragher. There will as usual be an open-mic after the Featured Readers have finished. New readers are especially welcome. The evening will also see the announcement of details of this year’s Over The Edge New Writer of The Year competition, which will then be made available here on our website. Alvy Carragher is currently a student on the MA in Writing at NUI Galway. Her poetry has been commended in the Gregory O’Donoghue Award, highly commended in the 2013 Over the Edge New Writer of The year competition and she came third in the 2013 Doire Press Poetry Competition. Alvy is the current Connaught Slam Poetry Champion. Kate Ennals completed the MA in Writing in NUI Galway last year. She writes both poetry and fiction. She currently facilitates both poetry and writing workshops in Cavan. Her writing has been published in Crannog, Skylight 47 and the Galway Review. She has had stories and poems in the anthology, From Ballyjamesduff to Belleek, which was published by the International Fund for Ireland. And Kate features in the new anthology, The Adventure Hat, published by the Black Fort Writers. 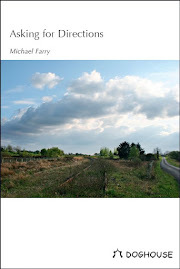 Michael Farry is a retired primary school teacher who writes both poetry and non-fiction. 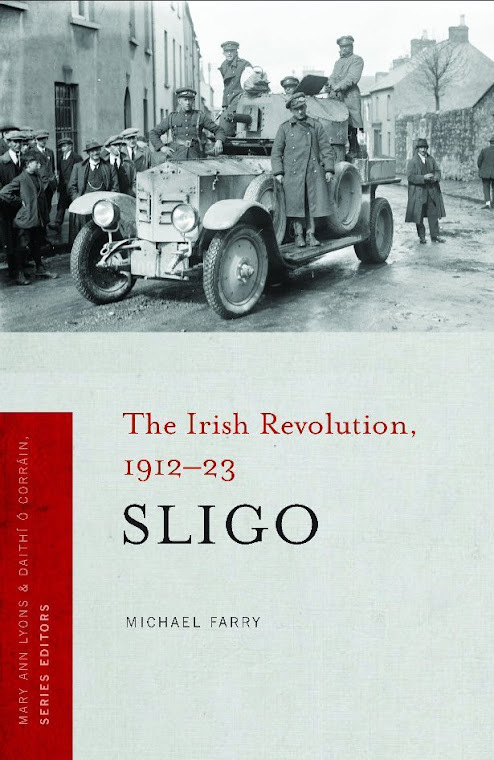 His poetry collection, Asking for Directions, was published by Doghouse in 2012 and his book Sligo: The Irish Revolution 1912-23, was published by Four Courts Press in the same year. He is founder and for many years was editor of Boyne Berries magazine published by Boyne Writers Group. One of the interesting aspects of visiting another country is noticing what is making the news there. On our recent visit to Perth, WA., (Western Australia - they are big into acronyms) a lot of the news was depressingly similar to news in this country and continent: something must be done about alcohol fueled disturbances and deaths, political and business corruption must be investigated, multinational companies close their local operations - Toyota are to stop car manufacturing in Australia in the next few years, etc. 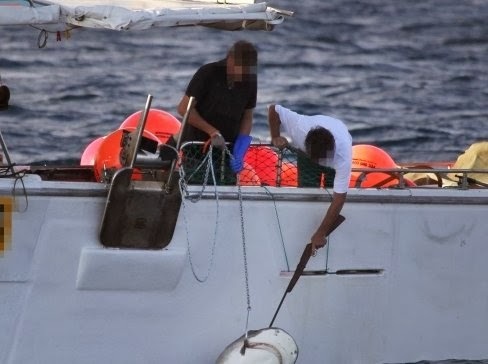 There were some different news stories such as the start of a shark culling policy by the Western Australian state government. This is in response to a number of kills by sharks in the recent years. There has been a lot of debate about the issue and numerous protests have been held. However the cull is underway and over twenty sharks have been killed. Drum lines have been used, floating barrels with a large baited shark hooks on a line, the barrels attached to anchors on the sea floor. Sharks when caught are killed or set free depending on species and size. More about this here, here and here. Picture above of a caught shark being killed is from The West Australian/Sharon Smith. By coincidence on the day we were leaving Perth, the local daily newspaper, The West Australian, printed a poem by well-known, prolific, Western Australian poet, John Kinsella, entitled Shark Tale Paradox, "for those lost to sharks, and for sharks themselves". who wants sharks culled. Surfers share the sea, know the risks. I read of 'catch and kill' like a wanted poster from the Old West. bring life if it grows awareness; death sentences only diminish us. Listowel Festival have just announced the creation of the Pigott Poetry Prize for books of poetry written by Irish writers. The Prize is for a book of poetry by an Irish Poet published between 1st January 2013 and 28th February 2014. There will be an award prize of €5,000 for the winner which will be presented at the opening Ceremony on the 28th May 2014. All books of poetry must be submitted to Listowel Writers’ Week before the 1st April 2014 and will be adjudicated by journalist and reviewer John Boland and renowned Poet Laureate, Carol Ann Duffy. For full details of this New Poetry Prize – Click Here. There are only two weeks left to enter the rest of the Listowel competitions, closing date is 1st March 2014. Regime Books is a collective of writers, poets, editors and publishers "hell bent on making books full of the best writing we can get our filthy hands on". They are based on William Street, Perth, Western Australia and they publish volumes of poetry and prose. Regime Books is also the publisher of Regime Magazine, which they call "the world’s most frivolous of serious literature magazines". That may be so but the three issues of the magazine so far published are very professionally produced. I'm delighted that issue three will include a poem of mine, written after a previous visit to Western Australia. This third issue of Regime will be launched on 12 February 2013 at 7.00pm, in Lazy Susan’s Comedy Den, upstairs at The Brisbane Hotel, 292 Beaufort St, Perth. The magazine includes new work by Australian and international writers. It also includes an extended interview with Melissa Harpley, the Art Gallery of WA’s Historical Curator, about the upcoming Guy Grey-Smith retrospective. 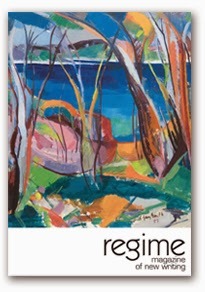 The cover of Regime 03 features the Guy Grey-Smith painting, ‘Torbay’, provided by the Art Gallery of WA, Perth. I'm disappointed that I won't be able to attend the launch. I'll be arriving back in Ireland from a visit to Perth on the day of the launch. I did visit the Regime office and met three of those involved, Nathan Hondros, Chris Palazzolo and Peter Jeffery, all writers themselves. We swapped comments about Irish and Australian poets, wondered what is the best poem ever written and discussed Robert Browning, Gwen Harwood, John Kinsella, etc. The Ogham Stone, the literary magazine curated by the 2013-2014 MA in English class in the University of Limerick will be formally launched at a reception on Friday, 14 February, at 4 pm in the Millstream Common Room, University of Limerick. All Ogham Stone contributors are invited to attend and to read their submissions. The publication is free, and copies will be available in O' Mahony's Booksellers on campus and the U.L. 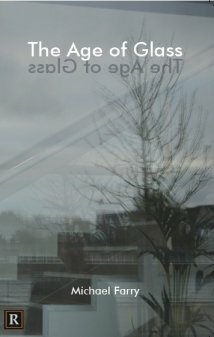 Glucksman Library from Monday, 17 February. Copies will be provided for the contributors and affiliates at the official launch. I'm delighted to have had a poem accepted for the magazine but unfortunately I won't be able to attend. Well done on the publication and good luck with the launch. A new literary e-zine, Silver Apples Magazine, has been founded by Alex Dunne and his long-time collaborator Gráinne O'Brien to showcase fresh and unique voices in Irish fiction, non-fiction, poetry, drama as well as new talent in the visual arts. 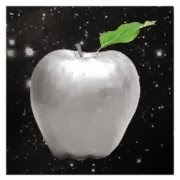 Silver Apples Magazine is now accepting submissions for its inaugural issue on the theme “Modern Mythologies” in the following categories: Short fiction, Creative non-fiction, Poetry (all forms), One act plays, Photography, Digital artwork and illustrations, Comics. There is no need for you to have a previous publication history to submit – whether you are a seasoned author or a photographer just finding their feet, as long as you have a vision or an idea they want to hear from you! Full submission guidelines are on the website. Email all submissions to silverapplesmag@gmail.com with the header “Submission” followed by the type of submission and the title of your piece. Also include a short bio (max 50 words). Closing date for submissions is 31 March 2014. Rebel Poetry is calling for submissions for their forthcoming anthology 'Fathers and what needs to be said'. There is no charge for entries and the book launch will be at the Grand Hotel in Fermoy and televised live via www.fermoypoetryfestival.com. Fermoy International Poetry Festival will host the launch on Friday April 4th 2014. A maximum of three poems will be accepted. Poets may enter only once and cannot enter under a different name. Only Microsoft Word Docs will be accepted and all poems should be kept to a single page. Notifications of accepted poems will be emailed to the successful poets on Friday 14 March 2014. Closing date for entries is 12.00 midday on Friday 28 February 2014.